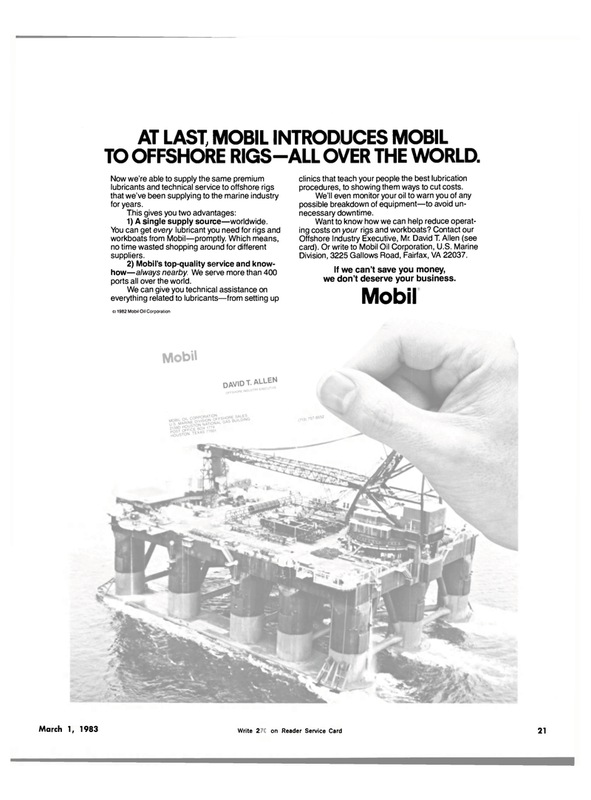 AT LAST, MOBIL INTRODUCES MOBIL TO OFFSHORE RIGS—ALL OVER THE WORLD. Now we're able to supply the same premium lubricants and technical service to offshore rigs that we've been supplying to the marine industry for years. This gives you two advantages: 1) A single supply source—worldwide. You can get every lubricant you need for rigs and workboats from Mobil—promptly. Which means, no time wasted shopping around for different suppliers. 2) Mobil's top-quality service and know- how—always nearby. We serve more than 400 ports all over the world. We can give you technical assistance on everything related to lubricants—from setting up c) 1982 Mobil Oil Corporation clinics that teach your people the best lubrication procedures, to showing them ways to cut costs. We'll even monitor your oil to warn you of any possible breakdown of equipment—to avoid un- necessary downtime. Division, 3225 Gallows Road, Fairfax, VA 22037. If we can't save you money, we don't deserve your business.